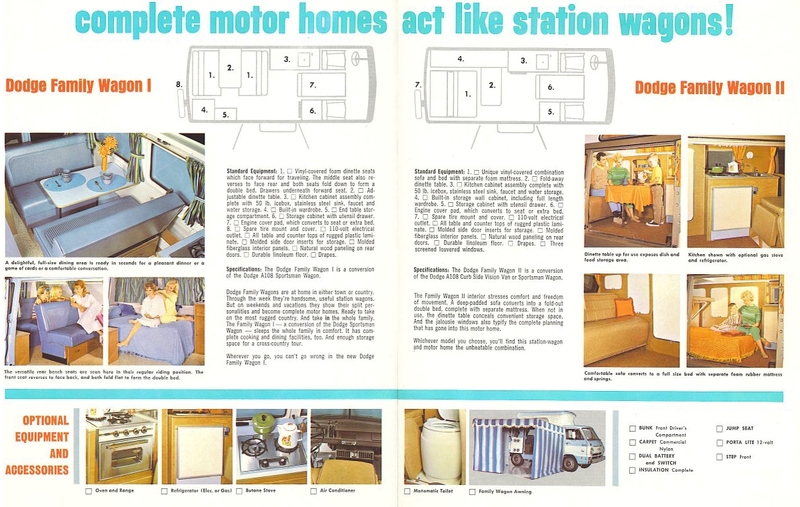 Displayed below are the images and text from an original Dodge Travco Family Wagon Brochure. Credit goes to OldDodges.com for hosting the original images. To see our other brochures check out the pages below. 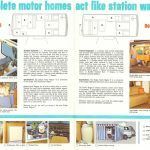 Complete Motor Homes Act Like Station Wagons! 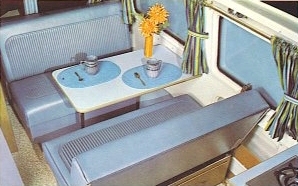 Vinyl-covered foam dinette seats which face forward for traveling. The middle seat also reverses to face rear and both seats fold down to form a double bed. Drawers underneath forward seat. Kitchen cabinet assembly complete with 50 lb. icebox, stainless steel sink, faucet and water storage. Storage cabinet with utensil drawer. Engine cover pad, which converts to seat or extra bed. Spare tire mount and cover. All table and counter tops of rugged plastic laminate. Molded side door inserts for storage. Natural wood paneling on rear doors. 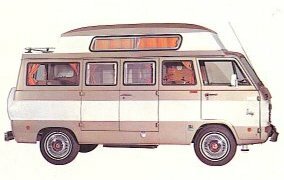 Specifications: The Dodge Family Wagon I is a conversion of the Dodge A108 Sportsman Wagon. Dodge Family Wagons are at home in either town or country. Through the week they’re handsome, useful station wagons. But on weekends and vacations they show their split personalities and become complete motor homes. Ready to take on the most rugged country. And take in the whole family. 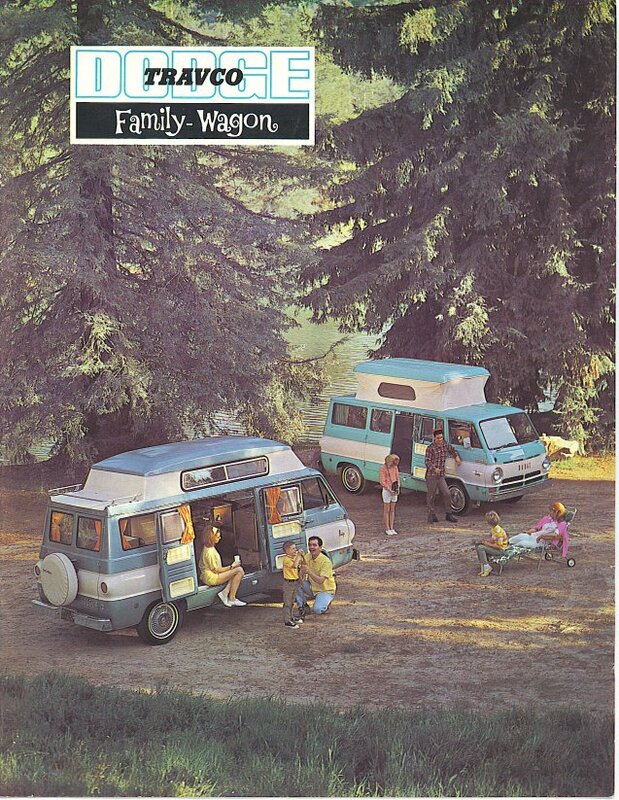 The Family Wagon I – a conversion of the Dodge Sportsman Wagon – sleeps the whole family in comfort. It has complete cooking and dining faciliites, too. And enough storage space for a cross-country tour. A delightful, full-size dining area is ready in seconds for a pleasant dinner or a game of cards or a comfortable conversation. The versatile rear bench seats are seen here in their regular riding position. The front seat reverses to face back, and both fold flat to form the double bed. Unique vinyl-covered combination sofa and bed with separate foam mattress. Built-in storage wall cabinet, including full length wardrobe. 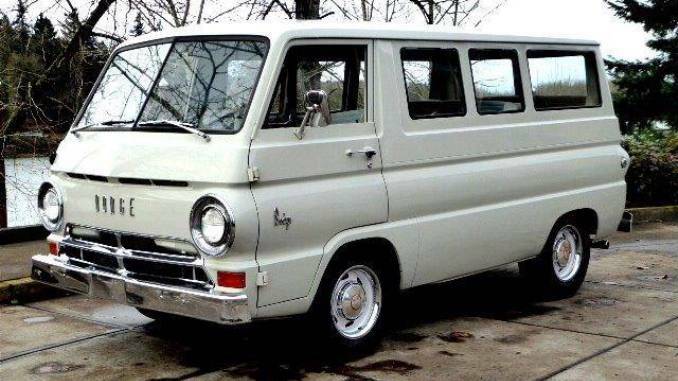 Specifications: The Dodge Family Wagon II is a conversion of the Dodge A108 Curb Side Vision Van or Sportsman Wagon. 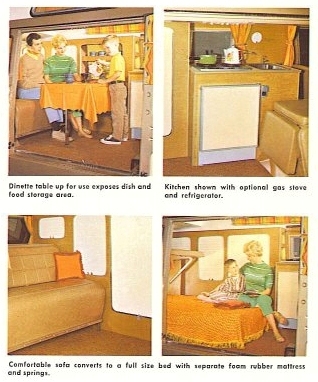 The Family Wagon II interior stresses comfort and freedom of movement. A deep-padded sofa converts into a fold-out double bed, complete with separate mattress. When not in use, the dinette table conceals convenient storage space. And the jalousie windows also typify the complete planning that has gone into this motor home. Whichever model you choose, you’ll find this station-wagon and motor home the unbeatable combination. Both Family Wagon I and II are available with the permanent Vista Top of reinforced, insulated fiber glass. EIther top gives more headroom and a feeling of spaciousness. 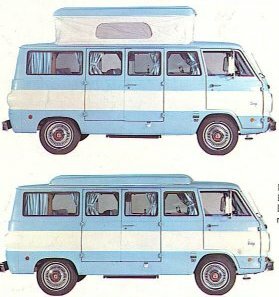 The Vista Top comes complete with sliding windows and screens, outside luggage rack, additional inside storage space, and the choice of one or two adult-sized foldaway bunks. Another advantage of the Vista Top is standing room, even for basketball players. It also has the added advantage of an exterior luggage rack. The optional Expandable Top gives 30 extra inches of head room, and 90 cubic feet of additional space for two adult-sized fold-out bunks. This top is durable, reinforced fiber glass, with nylon sides and zippered, screened side windows. It rises easily into place, thanks to the simple spring mechanism. Best yet, they’re built by the world’s largest manufacturer of motor homes. Hi so I have a Vista Top van — Im trying to fix/replace the windows. Any suggestions about where to look for parts, etc. ?